Abundant in Northern Europe, Asia, and North America, the moisture-loving stinging nettle thrives in the Pacific NW. Where I grew up, on 5-acres, next door to 5-acres, next to three additional lots of 1.25 acres, with, respectively, a small woods, wetland ravine, large vegetable gardens, and pasture for a cow named Buff, followed by a Shetland pony named Poncho, then a sheep whose name I don’t remember, there was ample habitat for nettles. Those with experience taught, and I learned early, that nettles were evil-touch one and you’d feel a painful sting followed by itchy bumps as your body tried to expel the injected toxins. Exploring the woods, picking late summer blackberries, playing kick-the-can at dusk, riding a bike down the ravine road, were all tinged with the danger of potential nettle stings. One summer, my then 14-year old cousin, legs hanging clown-like at Poncho’s sides, was either “let go” by or simply fell off the pony into a ripe patch of summer nettle. I think I’ll always remember how this tough-talking teen came howling from the woods, wearing only cut-offs, running home to be slathered in the soothing paste of baking soda plus water, the unfazed pony clip-clopping back to the pasture gate, and waited to be let in. We had family friends, who alone from anyone else I knew, and long before I would ever strive to do the same, practiced clean eating. They all had amazing, radiant, fresh-from-the-Alps skin, grew the largest easy-to-pull carrots, had a proper compost pile, and, as they lived within the city limits of our town, in a “real” neighborhood, had pavement on which to ride their bikes. So exotic. The most exotic thing, however, was that their mother used nettles for food. I didn’t actually find this exotic, I thought she was crazy: how could a person even think about eating a nettle? While our families got along, my mom and aunt also thought the Mrs. was odd, a sentiment I gathered while overhearing their bits of gossipy chatter. At that time, my parents didn’t embrace many new ideas. They had a compost pile for grass clippings and kitchen scraps, but they never used this on the garden. Their convention dictated animal manure as the way to fuel a garden. The food we ate was that of economy and, with my mom back to work a few days a week, ease. There were many ways to stretch and serve a pound of hamburger, thanks to Hamburger Helper, packaged taco or Sloppy Jo seasoning, etc. We ate our share of processed, industrial food-like products. For my parents, anything outside of their mutual box never received a blink of consideration. Fast forward more years than seem believable; through all of school, university, living off the grid, hanging out with yuppy suburbanites, semi-reclusive libertarians (before I ever knew that was a thing), far-east King County gardeners and goat keepers, hippies, middle school math teachers, recovering abuse victims, musicians, writers, all people living their lives different from mine. These experiences, followed by the seismic changes brought via parenting, made me want to embrace the new, to Feel the Fear And Do it Anyway. One of thing I have embraced is nettle. Figuratively, as they really do sting, but wholeheartedly, perhaps as homage to Mrs. P and her preferences, which no one ever considered might be helpful for me to understand, those many years ago. 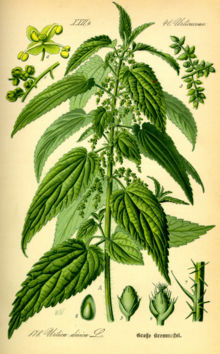 Most of my nettle inspiration has come from the aptly named Susun Weed, the face, voice, and pen of The Wise Woman Way. Ms. Weed is seriously into the wild plants that grow in/around our homes, gardens, roads, etc., especially, nettle and dandelion. While nettles are good eating braised, pureed in soup, kneaded into pasta dough, scattered on pizza as leaf or pesto, I prefer them dried, then infused into a nutrient dense beverage. I use nettle to supply most of my calcium, and to nourish my body in general. Areas around my parents’ home have nettle growing with abandon. Last fall, I encouraged them to not attempt any weed-kill, but let the nettles be. I told them they were sitting on a goldmine at $15/pound for dried nettle retail. 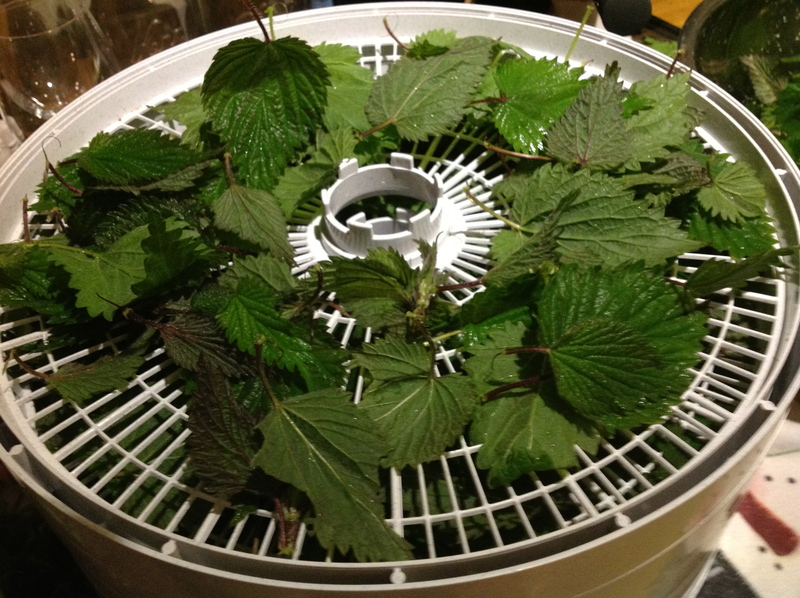 Come Spring, motivated by a Christmas-acquired food dehydrator, wearing gloves, long sleeves, and long pants, I happily advanced on the outcroppings of nettle, just beginning their push through the rich, undisturbed loam. I filled a grocery bag quickly, then returned home to wash, pat dry, and dehydrate. Herbs and plants like nettle don’t need a high temperature for drying. The dried plant will retain more nutrients if the air temperature stays around 90 degrees F, and since nettle comes packed with goodness, most notably calcium, iron, magnesium, and potassium, I am careful to not overheat. 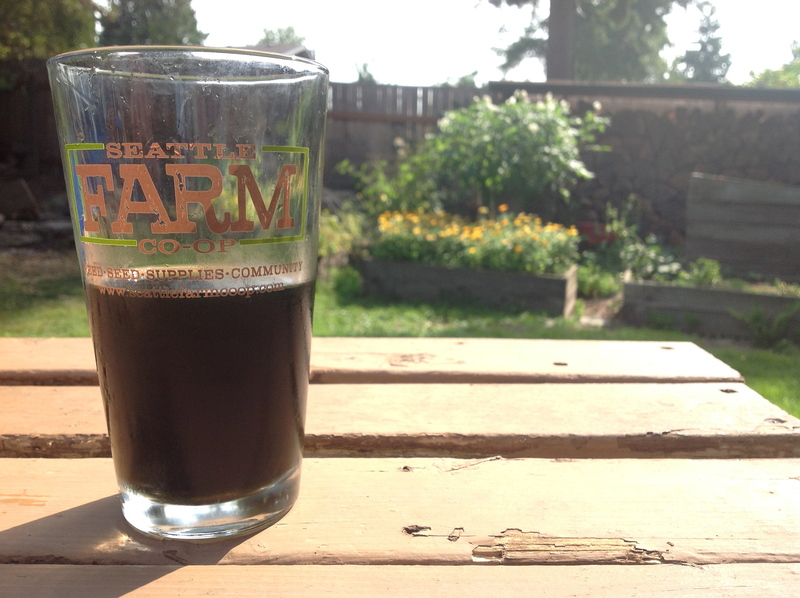 With the dehydrator filled, I sat back and waited for my “free” nettle. No longer would I need to visit the bulk herb section at my co-op, or order online from Eugene. 1-0z. 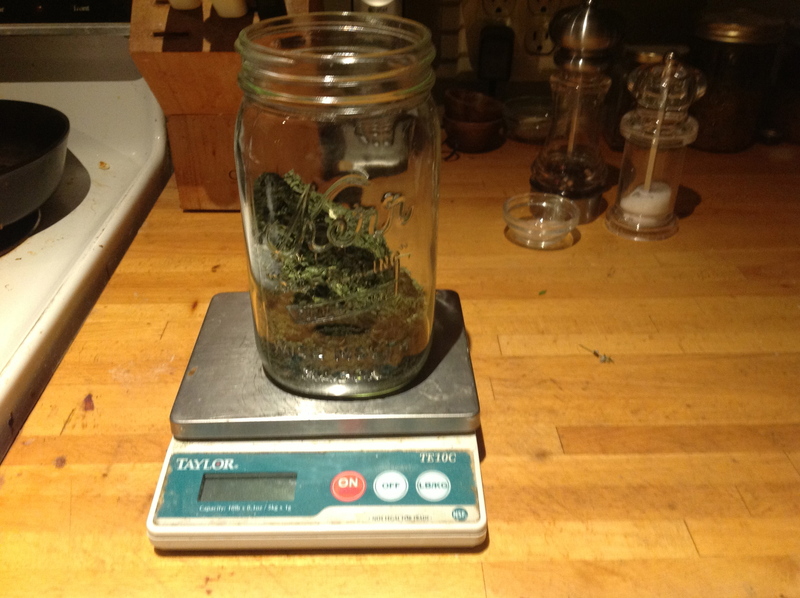 dried nettle awaiting boiling water. loosely filling 1/3 of a quart jar. My home-made dehydrator is 5 feet high, 4 feet wide and 4 feet deep with 7 trays made with wood frame and screening. It has a fan in the bottom and a heating coil. 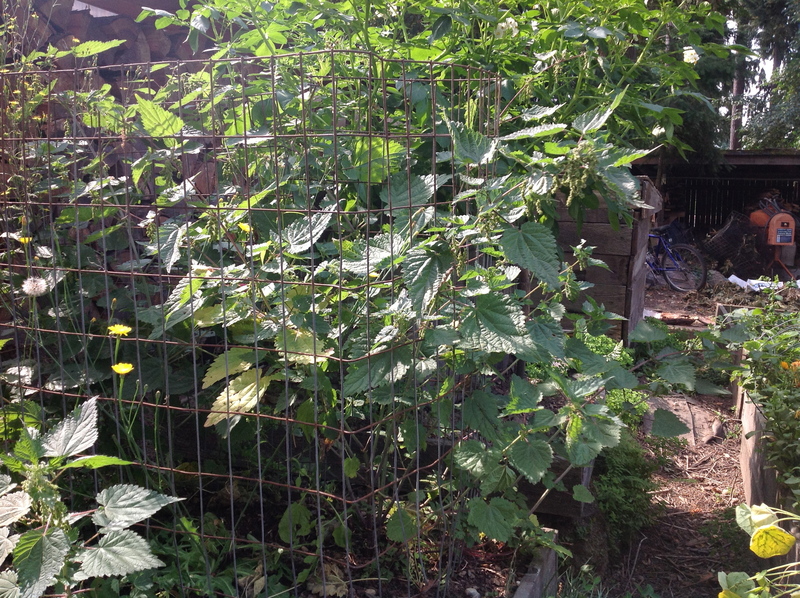 My nettles dry in about 2 – 2 1/2 days. I keep my herbs in 5 gallon buckets as my business demands a high volume of plants. 5ft x 5ft x 4ft. I was clearly not going to have the means to supply my nettle habit. 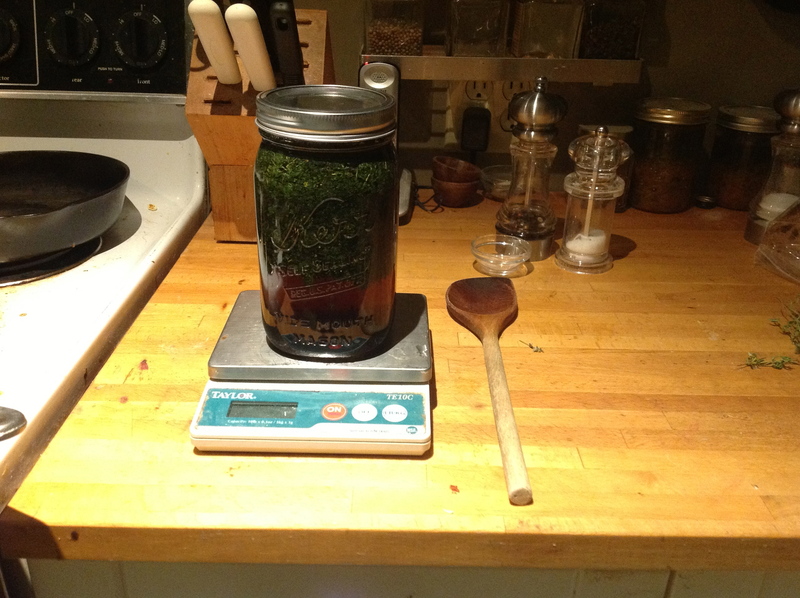 I did collect nettle on two more occasions, dried it, and infused it. 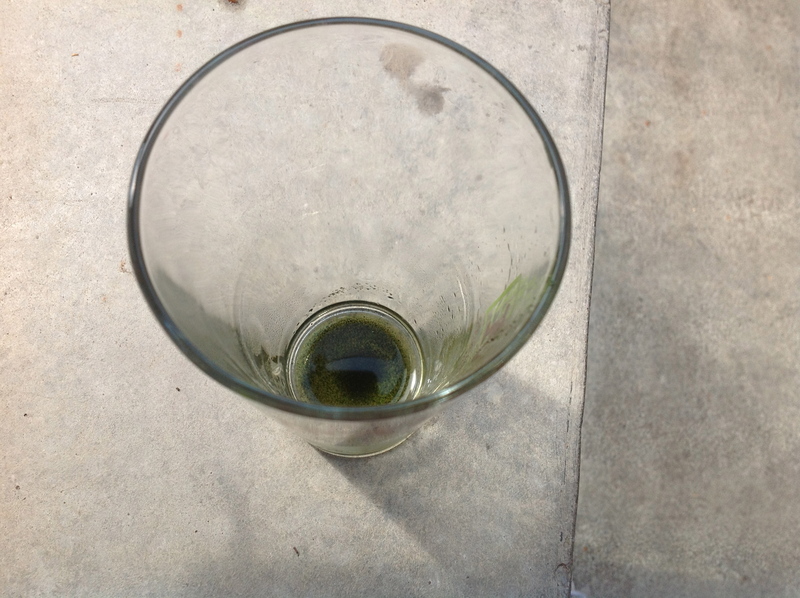 My local, extremely fresh dried nettle, was a vibrant green, and while nettle infusion has an alfalfa-y taste, the nettle I collected and dried tasted nothing but green. So green it was a little scary. It was WILD food. a bit wild myself, I offered up one of my secondary raised beds to transplanted nettle. Now I can gather fresh leaves easily, quickly, and economically. Tea anyone? This entry was posted in General and tagged garden, nettles, roots, spouse. Bookmark the permalink. Another great piece. i especially like the memory of the cousin on the pony with the dangling legs. Wonderful word picture.